Continuing in my grand “Seriously, I don’t give two damns about Garrosh and seriously SoO feels way to grindy even on LFR” vacation from MMOs, I decided to finally boot up my copy of RPG Maker VX Ace. I bought it on a steam sale over a year ago for like 60% off or something, and never really got around to using. In fact my girlfriend was using it most of the time making seriously awesome stuff that would just make my jaw drop. So I decided, Hey I like to run D&D campaigns, I’ve spent more time in Final Fantasy games than I have homework over the course of my life, why not give this thing a try? Like being zapped by the MCP and taking my first few steps out onto the Grid, my life was forever changed. 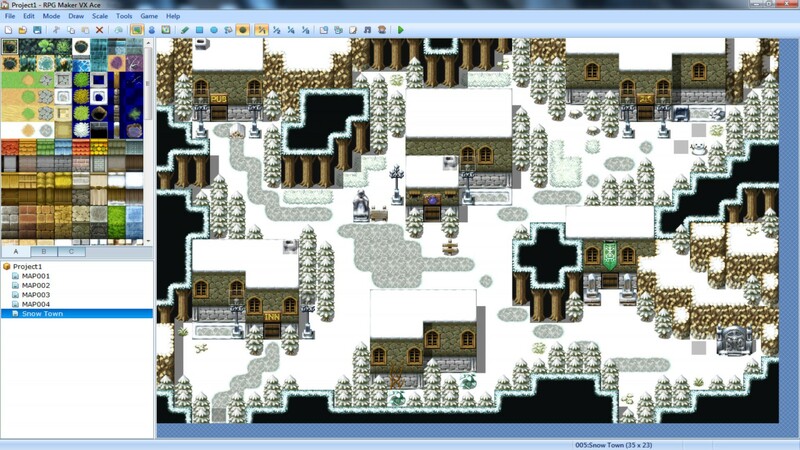 RPG Maker is like handing a kid the world’s biggest LEGO construction kit and just saying have at. It has a ton of power, lots to learn, and great deal of freedom. It comes with everything you need to start making your own role playing game and even comes with built in pre-sets that allow to start tinkering as soon as you open the box. I started with just using the basic tutorials that are on the website, which sadly appear to be incomplete. You get to the last lesson and it just stops, teasing you with a “In our next lesson” bit that dangles a juicy fruit of useful information just beyond reach. Luckily the web is vast and infinite and full of other non-official tutorials that offer thorough explanations of both the basics as well as the more advanced features of the game. While the advertisements for the software will boast that no programming is required, some basic knowledge of programming is incredibly useful. Knowing how concepts like loops, if…then…else’s, and variables will prove vital in working your way through making your story come alive. Luckily they’re not the hardest programming ideas to grasp. But yea, the more experience you have with programming the more you’ll be able to do. You can also add scripts to your game to add additional functionality using the Ruby based RGSS3 engine. For instance, I’ve added a World of Warcraft like Reputation system as well as a crafting system with the scripts in the game. Still the sheer amount of power you wield to tell any kind of story you wish complete with cutscenes, characters, classes, monsters, etc from the get go is an amazing feeling. Once I finished the tutorial I began work on a slightly more sandbox-y style game, where you would find clues and tips about where to go next but no clear goal or marked areas. For instance, someone in town mentions that the statue in the park had the gem stolen from it. That’s it. Where is the gem? Dunno. Maybe you’ll find it. Maybe you’ll find more clues. Maybe an unrelated clue will actually lead you to the same thieves that stole the gem. It’s awesome and fun to just lay clues down. Especially since this allows me to do a sandbox style adventure when I don’t know if I could ever accomplish one in my Dungeons & Dragons campaigns. However, even more than a D&D game using RPG Maker requires a lot of planning ahead of time if you don’t plan on using the built in pre-sets for everything. Just testing a formula for how much damage a character can take or dish out was a long process of trial and error. 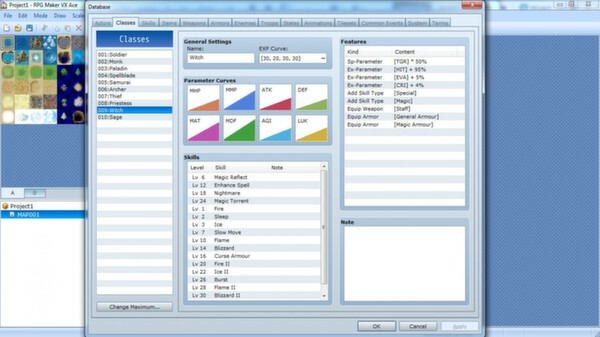 Then planning things like stat growth, abilities, experience rates (which are somewhat limited by the software itself. Like you can’t set it to take more than 90 XP to get from level 1 to 2. Though you might be able to change this with a script. Probably can. There hasn’t been much I’ve found that you CAN’T change with a script.) So before I’ve gotten too far in the game I’m already buried neck deep in spreadsheets. But hey kids, let this be a lesson. Learn Excel. It can be used for fun someday! The sheer joy is in the creation though. You’re making something. Something new and yours. It’s the kind of feeling that ignites your passion when you built the Three-Headed Dragon Super Space Ship With TWENTY Lasers So It Can Totally Blow Up Mark’s Ship Yes It Can Mark Shut Up Mark III with building blocks when you were a kid. I have no idea if anything I make will ever turn out to be decent, or even great. Nor does it matter if I can or can’t monetize it. For now, I’m having fun with it all. However, I might upload a copy of the first city as a ‘demo’ or something. I’d love to hear what people out there in the Interwebs might think of it and get some feedback. Who knows?